What is an Inert Gas or IG System on Ships? – STS Marine S.A.
1. Exhaust gases source: inert gas source is taken from exhaust uptakes of boiler or main engine as contains flue gases in it. 2. Inert gas isolating valve: It serve as the supply valve from uptake to the rest of the system isolating both the systems when not in use. 3. Scrubbing tower: Flue gas enters the scrub tower from bottom and passes through a series of water spray and baffle plates to cool, clean and moist the gases. The SO2 level decreases up to 90% and gas becomes clear of soot. 4. Demister: Normally made of polypropylene, it is used to absorb moisture and water from the treated flue gas. 5. Gas Blower: Normally two types of fan blowers are used, a steam driven turbine blower for I.G operation and an electrically driven blower for topping up purpose. 6. I.G pressure regulating valve: The pressure within the tanks varies with the property of oil and atmospheric condition. To control this variation and to avoid overheating of blower fan, a pressure regulator valve is attached after blower discharge which re-circulates the excess gas back to scrubbing tower. 7. 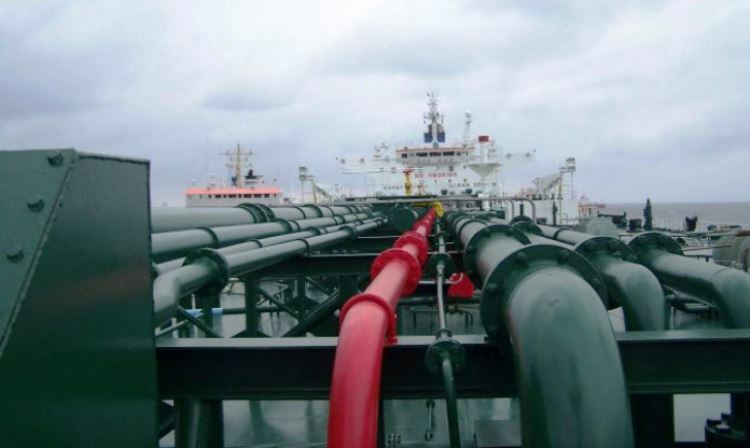 Deck seal: Purpose of the deck seal is to stop the gases to return back which are coming from the blower to cargo tanks. Normally wet type deck seals are used. A demister is fitted to absorb the moisture carried away by the gases. 8. Mechanical non return valve: It is an additional non return mechanical device inline with deck seal. 9. Deck isolating valve: The engine room system can be isolated fully with the deck system with the help of this valve. 10. Pressure Vacuum (PV) breaker: The PV breaker helps in controlling the over or under pressurization of cargo tanks. The PV breaker vent is fitted with flame trap to avoid fire to ignite when loading or discharging operation is going on when in port. 11. Cargo tank isolating valves: A vessel has numbers of cargo holds and each hold is provided with an isolating valve. The valve controls the flow of inert gas to hold and is operated only by a responsible officer in the vessel. 12. Mast riser: Mast riser is used to maintain a positive pressure of inert gas at the time of loading of cargo and during the loading time it is kept open to avoid pressurization of cargo tank. 13. Safety and alarm system: The Inert gas plant is provided with various safety features to safeguard the tank and its own machinery.